Gmail – I forward all of my email from other accounts to Gmail. One of the things I use it for (often) is searching old emails and also for subject searching (all the listserves I belong to). Bloglines – I use this for all my RSS/news feeds. Google Docs and Spreadsheets – I use this primarily for storing (non-sensitive) documents I might want to access when I don’t have my own computer with me. MyStickies – I’m intrigued by the ability to leave small notes on websites to point out the important spots or text passages. They are planning to add to ability to share notes with other people, something that might come in handy when pointing out web resources to friends and family. Remember the Milk – a “to do” list and reminder service. It can be integrated with Gmail or added as a Firefox extension. I subscribe to the Lifehacker blog and read it when I have time to digest it. It’s a great site with lots of technology and productivity discussion. 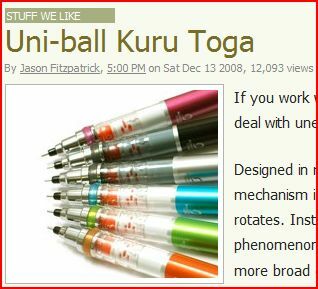 Looking at the blog site for this week’s tasks, I found a “cool tool” that looks great – a mechanical pencil whose lead rotates slowly to prevent flattening, which leads to broader lines than wanted. I happen to really love mechanical pencils and do most of my writing and note-taking with one. The Getting Things Done video on YouTube sounds as if it would be a worthwhile watch (45 minutes). I own the book, however, so unless I find an hour with nothing to do, and that’s pretty rare, I won’t be viewing it. The GTD bookmarks on Delicious are worth a second look, though. Reviewing Lifehacker’s 2007 Guide to Free Software and Webbapps will take some time. It was published Dec 17, so perhaps I’ll wait until the 2008 edition comes out (assuming it’s an annual post). Mindomo – mindmapping application. I do occassional mindmapping exercises on paper. I’ve looked at other online mindmapping apps and in general, I feel very constrained by the screen size. I may check this application out in the future. 43Things – I have friends who use this site. I haven’t started yet, but it’s on my “to do” list. I looked at some of the “inspiration” categories for newbies (Creativity and self-expression, Travel, Popular goals). To my list, I would add: take more photos, learn how to use my video editing/creation software, spend more time in my studio painting and drawing, stop procrastinating, go through my piles of paper and file or recycle. Those are just for starters. Diigo – allows you to highlight passages on webpages and save and share them. There’s a demo Youtube video worth watching. Sticky Notes – desktop program allowing you to paste stickies to your desktop. Sticker Lite is the free version. Google Docs and spreadsheets – I’ve used these for group projects, but in general, it hasn’t been a success. Though I’ve uploaded documents for collaboration, the other people in the group haven’t gotten onboard. The only person using the collaborative functions was me! iGoogle and MyYahoo – I’ve had these set up for years, but haven’t done much with them. I did more customization and blogged about these during Week 5 of SLA 23 Things. CutePDF – a great tool that lets you create PDF documents as one of your print options from within your applications (I use it with MS Word and Excel). PDF converter – a web-based application that allows conversion from a variety of applications. There’s a script you can add to your own website that lets visitors print pages with a single click. This task involved looking at seomoz’s 174 Web 2.0 Sites in 41 Categories list. This site has a cornucopia of both fun and work-related sites and applications – lots to explore in the future. Health – hoping to find some interesting new sites to use in my work. The winners focus on consumer health, though, so they aren’t very useful to my professional life. All focus on community building among people looking for health information or sharing their stories on specific conditions or treatments. Hosted Wikis – curious to see which were included, I see that both pbwiki and wikispaces have won awards (these I looked at during Week 7 of SLA 23 Things). The other winner was wetpaint – another free wiki option I might test drive in the future. Social News – Smaller and Niche Sites – NowPublic is a news site, with the tagline “Crowd Powered Media” – worth a close look later. Visual Arts – This is one of my main interests in life, so I checked one of these as my site to explore in more detail. Two of the 3 award winners deal with the visual representation of numeric data (Swivel preview and visualcomplexity). Though I don’t do much work with primary data these days, I love to see the creative way other researchers represent their findings visually. As someone who has felt the synergistic effects of working with other artists (on individual pieces, rather than a colloboration, during life drawing sessions), I find it really interesting that this experiment is taking place. I know of artists who do work collaboratively and they love the experience. The composite picture being created can be zoomed in and out and is clickable so you can see larger versions and the details of the artists who created specific tiles in it. Though I haven’t joined the community yet, I probably will – and I’ll be sending the URL to friends, for sure. TheBroth is another collaborative art site that won an honourable mention – an additional site to explore in the future.